A very important way in which government has supported the creative arts is through cultural education. Arts education in early childhood and school curriculums ensures that New Zealanders have the skills and confidence to enjoy cultural experiences. Tertiary instruction and specific training in cultural disciplines have produced practitioners able to maintain existing cultural traditions and develop new works and forms of expression. 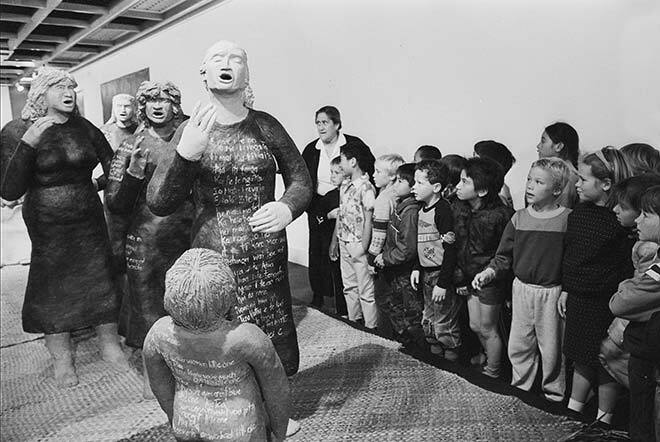 In this 1988 photograph taken at Wellington City Art Gallery, Irihapeti Walters talks to children from Tītahi Bay North School. The sculpture they are looking at is 'Ngā morehu', by Shona Rapira-Davies.